Nong Inlay is truly a hole-in-the-wall patronized mostly by young Burmese men who all seem to know each other. Decor is very minimal, with folding chairs and wall-bench seating. Named after a lake in Burma's northeastern Shan state, Nong Inlay specializes in Shan cooking, which draws on influences from neighboring Yunnan and Sichuan in China. 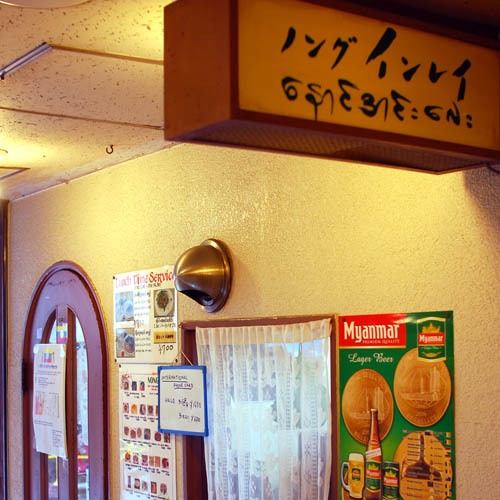 Only a part of the menu is in Japanese, and descriptions are short and limited, so it is best to ask what's what. The Shan Chicken (Y800) was small chunks of chicken and vegetables stir-fried with hot peppers in a tangy miso-based sauce, and was a lot like Kung Pao chicken. The adventurous may want to try the Shan-Iei (Y400) - a reddish-brown-colored Shan-style liquor that's about 25% alcohol, with a sweet flavor reminiscent of some kind of herbal remedy.